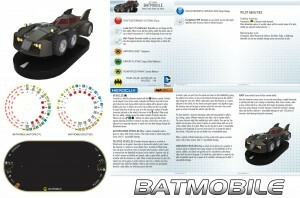 WizKids starts off their previews of the upcoming Batman set with a new model type for the game: Vehicles. And they start with one of the most iconic vehicles of all, the BatMobile. Today we are very pleased to begin a week of special sneak-peeks into the next DC HeroClix set, Batman! Arriving in stores everywhere this fall, and coinciding with the release of the next HeroClix Storyline event, DC HeroClix: No Man’s Land, DC HeroClix: Batman introduces the next big game mechanic for HeroClix: Vehicles. We know fans are very excited about Vehicles in HeroClix, and these special pieces are definitely going to be the driving (ha! get it?) force behind some special strategies, tricks, and tactics in the months to come after release. However, before we take a look at a vehicle from the set, let’s take a moment and familiarize ourselves with the game play mechanics of Vehicles so that we have a better idea of what they will bring to your HeroClix game.